"Heartbreak" token, awarded by Sunpriat. When editing the infobox in https://fr.wikipedia.org/w/index.php?title=S%C3%A9bastien_Texier&veaction=edit , the heading is misaligned (overlapping with button), see screenshot. This is the same issue as T70571, where this has been declined (the suggested solution is to make the button labels shorter). The abandoned patch https://gerrit.wikimedia.org/r/160812 would probably still work. The solution would be not to absolutely center the title if it can't fit. Thanks, Bartosz. The current behavior is clearly undesirable (useless or partially overlapping dialog titles); we may need to do both (shorten some button labels and optimize placement). I defer to @Jdforrester-WMF on the final approach. This just became worse with the new design, IMHO. 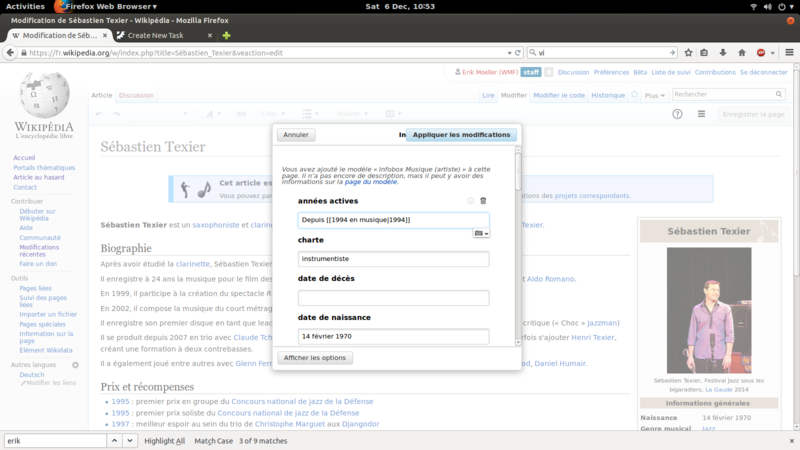 Aklapper added a project: VisualEditor-MediaWiki-Templates. FYI this was brought up again by a user testing Citoid. "tempfile.ru" is not very reassuring about the lifetime of these links, so let's copy here. Jdforrester-WMF edited projects, added VisualEditor 2014/15 Q4 blockers, OOUI, OOjs-UI-next-release; removed Patch-For-Review. And makes it look worse in others. We'll need to test it post-release to see what further tweaks we need to make VE-side. Well, no, it doesn't change anything except for the case where the label would be clipped. The main place people encounter this is where all three labels are very long; this "fix" doesn't actually help them. matmarex added subscribers: Amire80, Etonkovidova.